Startup incorporation and corporate management made simple. Setting up your company has never been so easy or quick. If you have a computer and internet connection, get your company incorporated in Delaware and knock out the post-incorporation setup right away. Why Delaware? Through Valcu's incorporation tools you'll put in place the founder agreements Silicon Valley investors expect, which you won't be able to get using other self-help tools. Don't waste time and money editing documents. Valcu provides you the self-help tools to quickly and easily navigate the formation process. Ready to incorporate? Got 3 minutes? Join us in quickly running through an incorporation. Valcu brings together document generators, modeling tools and data from numerous public source. By curating and standardizing inputs, Valcu allows you to focus directly on the important decisions with little effort. You build your core business; we'll expedite the back office. Valcu brings a wealth of industry knowledge, having been founded and built by an attorney and CFA charterholder who represented some of the most successful startups and venture capitalists in the U.S. and worldwide. Whether you're a Founder, CFO, GC or an Advisor, Valcu gives you the do-it-yourself tools to robustly model and manage your company, be it incorporating, raising financing, generating a valuation or maintaining your capitalization. Much of the professional world lives in DOCX. We've gone to great lengths so that you don't have to use a programmer's text editor or command prompt (just open up Word), don't have to install plugins, don't have to pick up lots of syntax, don't have to go through detailed specifications and don't end up with a document format that you can't save to your file system or attach to an email and send to your client. Automate your own documents in minutes (or seconds). Inputs are automatically generated from your document, and you'll be immediately put in a position to create a final, executable document. We've spent lots of time going back and forth on documents with lawyers. We got in the mode of writing readable fields in a Word document for lawyers to see and understand with little effort. Our automation tools now take the same readable language, and make it executable. Our platform and models have broad reach. We are rapidly developing these products to simplify management of your startup. Capitalization Table View, update and analyze your capitalization table in the cloud. 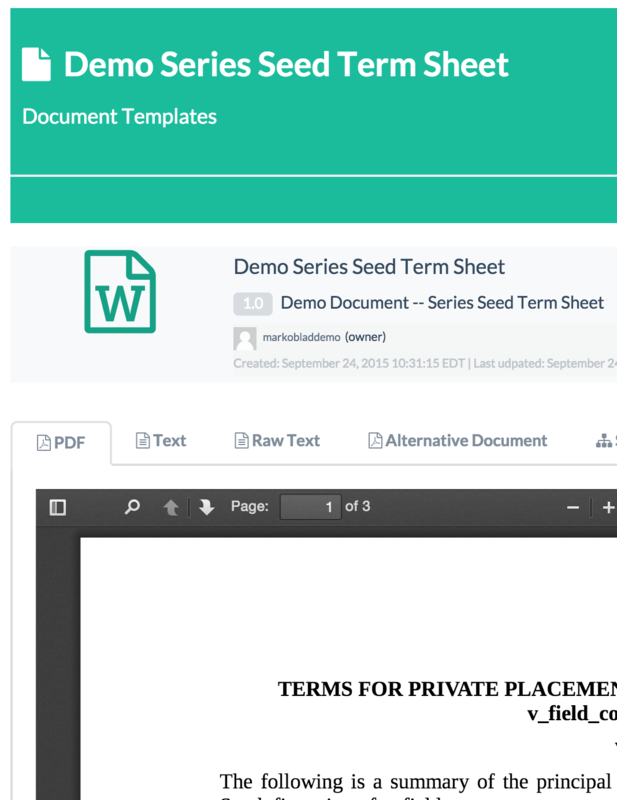 Financing Term Sheets and Documents Our integrated models make document generation a breeze. Private Company Valuations Feed your data through our models for enterprise value, option pricing and scenario analysis. Board Book Your corporate transactions, capitalization, valuations and financial statements in one place.